Wyvern numbering puzzles me more than a little. This is a Wyvern Perfect Pen No81. So is a more slender, longer pen. How does that work? Anyway, though they can be troublesome in some respects, I have a soft spot for Wyverns. They tend to lose gold plating on the clips, like this one, and not infrequently they display gaping lever apertures. This one has a touch of it, but it isn’t too bad. What makes up for these faults is that they make a pen that’s shaped well for the hand, comparatively wide in the centre of the barrel, narrowing just a little at each end. Then there’s that brown/gold/black pattern which I’m very fond of. 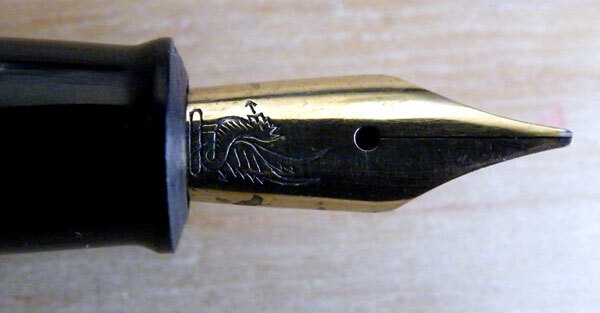 Finally, they have these beautiful nibs with the perky little Leicester dragon. They’re not just for looking at, those nibs. Some, like this one, are flexible, with excellent return.